On July 4/17, we honor the memory of the Royal Passion-bearers, murdered in 1918: Tsar Nicholas Alexandrovich II, his wife Alexandra Feodorovna, and their children—Tsarevich Alexei and the Grand Duchesses Olga, Tatiana, Maria, and Anastasia. 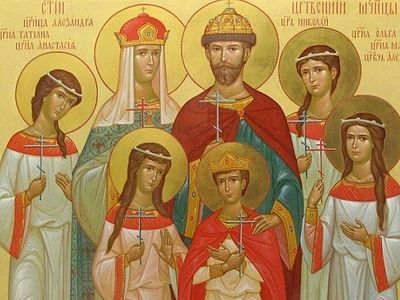 Archpriest Artemy Vladimirov speaks about the example given to us by the lives and deaths of the holy Royal Martyrs. Ekaterinburg Golgotha. Who among us is not aware of this sorrowful but high collocation? It is not just a collocation, but the main tragedy of the twentieth century, which determined the shift in the world-historical process. Thanks be to the Lord that Russia, in these past one hundred years stained with the sin of apostasy and estrangement from “the traditions of deep antiquity,” in the person of the members of army command who changed the religious oath of allegiance given to the tsar and Fatherland, our homeland, bleeding, dismembered, suffering the frightful shame of the 1990s as retribution for official atheism, is rising now from its knees. It arises, no doubt, by the prayers of the holy Royal Martyrs: the passion-bearing Tsar—His Imperial Majesty Nicholas Alexandrovich II, his august wife Tsarina Alexandra Feodorovna, Tsarevich Alexei, and the Grand Duchesses Olga, Tatiana, Maria, and Anastasia. You well remember, dear friends, that time when it was impossible [in the Soviet Union] even to show photographic images of the tsar to someone or to keep them in your own home without consequence. The industry of slander, established in the pre-revolutionary years in the Masonic press, a kind of flywheel, has, alas, not stopped to this day. However, you can’t hide an awl in a sack, and all the more truth and love are victorious, gradually dissipating this utter darkness and twilight of misconceptions of the history of the Russian land. Our president often reminds Russian citizens of the state’s millennium of history, in which a red thread is woven into the fate of the Ruriks and Romanovs, those princely and tsarist dynasties, the members of which became the masters of the Russian land by the will of God, building up the potency our Orthodox motherland. Today, photographic images of the tsar, the mournful faces of him and his family—the great Gatchina prisoners, then Tobolsk prisoners, and then Ekaterinburg martyrs—are illuminated and radiant with their halos on the royal icons. Tens of thousands are gathering in Ekaterinburg in these days. You have to see how, at the Divine Liturgy in the open air, both the elderly and children, and pastors and flocks, and the wise and simpletons—all of Russia—commune. It would seem that not long ago, Russia was walking in the Velikoretsky cross procession, manifesting miraculous endurance, bravery, and patience. And now, in the gray Urals, at Ganina Yama, where once under the cover of darkness was committed satanic regicide with the mutilation and incineration of the fragrant bodies of the Royal Passion-bearers, our people are again gathering to pray for the spiritual rebirth of the Motherland. Never will I agree with those who say that only the last months of his life merited the glorification of the tsar—as a passion-bearer, as a man staring death in the face and receiving it worthily with repentance and a prayer for the Motherland on his lips. Forgive me, but the worthiness of any tsar and ruler of the people is known by a very simple criterion—the increase of the population. Russia grew by 50 million people during the reign of Nicholas Alexandrovich II. Show me, demographers and sociologists, where, when and in which country the people so multiplied, wanted to live, and to build, and to create, and to glorify God by the fruits of their hands, as in Russia in the late nineteenth century to the beginning of the ill-fated twentieth century! The tsar and the government established by him, in such difficult and turbulent times, outliving the vile “maidan,” paid for by overseas puppeteers in 1905-1907, returned the Fatherland to its creative pace. If not for the second bribe, if not for the defilement of minds and hearts by anti-Christian propaganda, if not for the terrorists who eliminated Peter Alexandrovich Stolypin, who alone, like a Holy Russia bogatyr, withstood the radical elements of the foolish, I think we would be 500 million strong today. But let’s not speak in hypotheticals—which history, the best teacher, neither understands nor accepts. 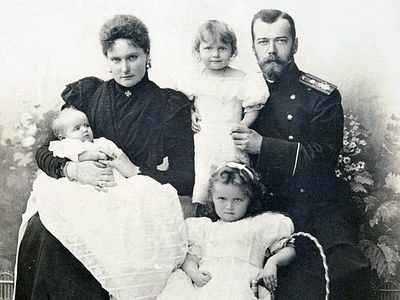 Let us again cast our gaze upon the beautiful faces of the Royal Passion-bearers, and may they—Tsar Nicholas Alexandrovich II, and his sacrificially serving family of wife and royal children—guide us: both verbally, by their diaries, and by their outward manner, which attracted millions of hearts to the contemplation of the wondrous spiritual and physicial beauty, and the harmony of mind and heart which the royal family possessed. The tsar is an example of fulfilling the duty of loyalty, a man who knew how to answer for his word, a man always fulfilling his promises, a guarantor of peace in Europe, thanks to whose podvig Russia, as never before, was near to victory in that patriotic war which, wholly undeservedly, is termed imperialistic in post-Soviet textbooks. Today, when male loyalty and valor are scanty to the extreme; when family heads do not hesitate to abandon those whom they have domesticated; when men have forgotten wherein lies their strength and spiritual beauty, and have become turncoats, serving their own passions; today the tsar convicts’ gaze, calm, cool-headed, somewhat sorrowful, and full of adamantine faith in God’s Providence, sobers us. From him, the Russian Tsar, we must learn faith and faithfulness, honor and oath, given once and forever to God and country. We need such men today, upon whose firm shoulders their life companions can lean. We need such fathers, whose authority would be unwavering for their children. Our tsar wonderfully combined within himself bravery and meekness. No one ever saw him in anger; he wonderfully controlled himself. But his royal gaze, the wagging of his finger, one of his instructing words silenced the most impudent, bold, ungirded people, because before the Tsar’s words went his actions; because the grace of the anointing, communicated to him in the Sacrament of marriage to his kingdom, was multiplied incessantly by his labors day and night for the welfare of the nation. The Tsarina. Yes, high society did much to besmirch this faithful companion of her sovereign husband. How many millions of dollars turned green from anger were consumed by this odious slander! The opponents of the Fatherland did not scorn any kind of insinuation to smear the bright face of Tsarina Alexandra Feodorovna. They blamed her in connection with Gregory Rasputin, called her a German, charged her with treason, called her prudish, cold, and arrogant. All this she endured meekly, because Christ knew how to be silent in the face of those paid “witnesses,” in the face of the Sanhedrin, infested with the blasphemy and pride which make a man deranged and hopelessly sick. It’s a daily podvig to preserve presence of spirit, goodwill, and a smile for your subjects. It’s a podvig—unceasing mercy and charity, about which the people didn’t spread any information on the internet or print in any newspapers. But when the Great War broke out, the Tsarina, exchanging her bright dresses for a nurse’s uniform, together with her daughters personally cleansed the pus from the Russian soldiers’ wounds, was present at their operations, encouraged the wounded by word and deed, and kept daily vigil in the hospitals that the royal palaces were turned into. 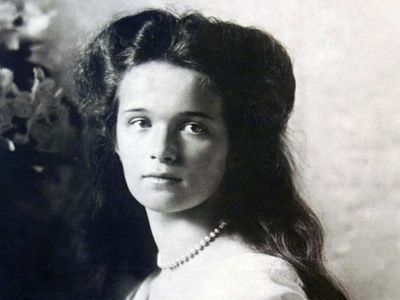 She prayed tirelessly for Russia, for her people—weak, feeble, easily yielding to temptation, but endlessly loving and responsive to manifestations of love, of which the heart of our Tsarina was so rich. She trusted none other to teach her children the Law of God, but did it herself, just as she fed them with her mother’s milk. To cultivate today chaste and pure souls, to cultivate unblemished, vestal hearts, to raise up your own children well, with neither obstinacy nor estrangement from their parents, but only an unending homage to their moral authority, is the task of tasks. It seems practically unbearable to modern parents, unless they attract God’s assistance upon their labors by their pious lives. Gazing upon the faces of Olga, Tatiana, Maria, and Anastasia, and peering at the un-childish, serious expression on the face of Tsarevich Alexei, who dreamed of being a good ruler and would often say that there would be no unhappy or sick people in his kingdom, looking at their bright and sorrowful faces, we find in them those guardian angels of our youth, our childhood, which can vanish without a trace and head for the wayside of world history, if it does not receive, as a baton, a lamp of faith from our ancestors—the Orthodox faith, the faith of those who can see, the faith which warmed the hearts of the Royal Passion-bearers. To be able not to sink into despair from armed vermin, who by their very presence jarred the senses and perturbed the hearts of the maiden princesses, to be able to anticipate your death but not despair and not become embittered, and, as per the Gospel, to pray for your executioners is not just an art, ability, or skill, but it is a podvig, which the rare man in history could emulate. That is why so many insincere and cynical people today look to all the attempts of corrupt directors and inexperienced hack-scribblers to belittle the significance of the royal family for the fate of Russia and its future. We truly hope that the rampant freedom of mass disinformation media in our society will soon be replaced by a healthy censorship, which obstructs the mouths of those with a seared conscience, those who belong to the party of destruction, those whom Alexander Sergeevich Pushkin called degenerates. For those who do not respect the history of their country, and consign the labors and accomplishments of their fathers and grandfathers to oblivion, are deprived of human dignity and, in all fairness, cannot even be called a people, which God calls us to become with faith, love for our land, and willingness to sacrifice at least something small in service of others. Today, rallying around the Royal Passion-bearers and Martyrs, lifting our gaze to their crucified height, we express, brothers and sisters, our firm faith and hope that thanks to the prayers of the Royal Martyrs, the Russian world resurrecting in our Fatherland will find a statehood native and inherent to it, so necessary for the salvation of the entire cosmos from the spirit of godlessness, corruption, and satanic pride. A reference to the recent events in the Ukraine and its violent overthrow of the government on the Maidan, or Liberty Square.